Suncream is a big deal for me. I hate being tanned, let alone burned, so I always go for the highest SPF I can and lather it on. 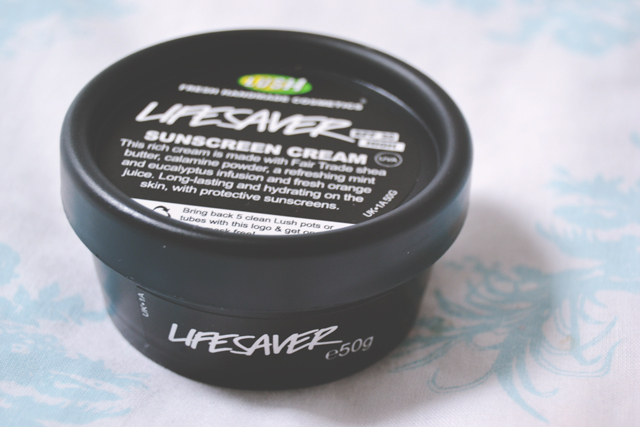 When I heard Lush was bringing out a range of suncare, I was ridiculously excited and I was lucky enough to receive a pot of Lifesaver at the Lush Summer Skin event in Portsmouth. 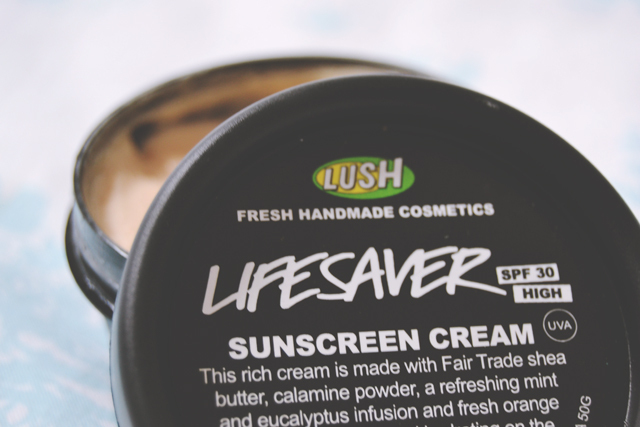 Lifesaver is a latte-coloured cream sunscreen, with calamine, mint, eucalyptus and orange extracts. As with most Lush products, the fragrance is fairly strong and it is unusual at first, but I came to enjoy the minty calamine scent. On application, the cream glides evenly onto the skin. 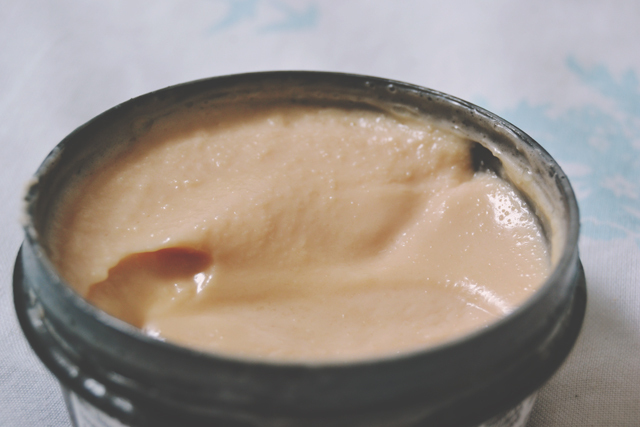 It applies lightly and the shea butter moisturises the skin, but it doesn't absorb very well. The overall result is a fairly sticky, oily feel with a shiny look that lasts all day. However, the SPF 30 certainly does do the job. In Florida, with a UV index of 9 every day, I didn't get even slightly burned. Although Lifesaver is expensive, at £15 for a 50g pot, a little goes a long way, so it lasts quite a while. Besides, suncream is expensive anyway so you may as well splash out on a nice, natural one, right? So what's the catch? Well, it turns out I'm horrendously allergic to it. It took me a while to realise what was causing my painful, puffy eyes since I've never had a reaction to a beauty product before. 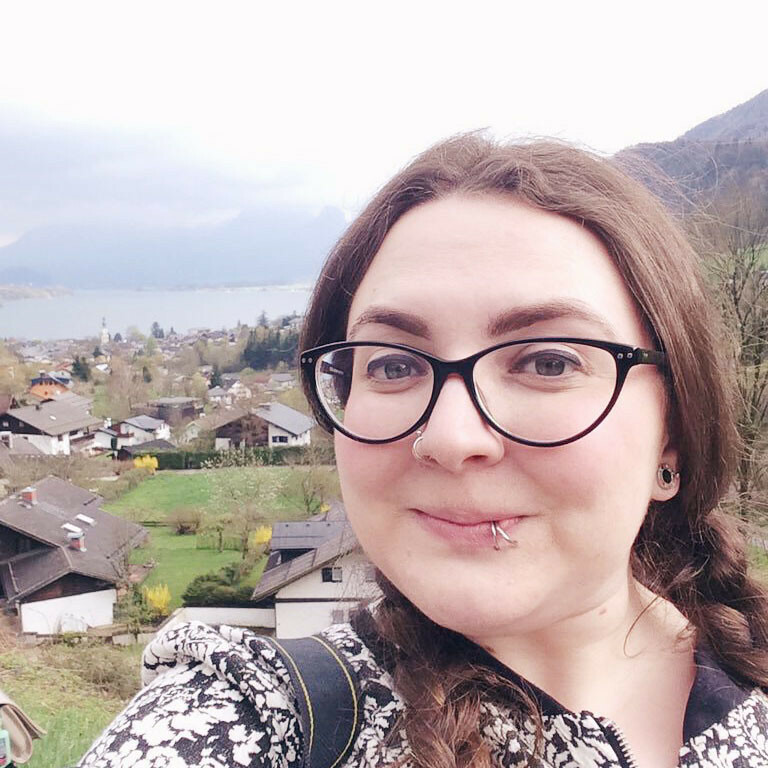 Once I switched to a standard brand, my problems stopped. You can imagine my horror at finding out I'm allergic to a Lush product! I'm not sure if I would recommend Lifesaver. Although the cream is luxurious with wonderful ingredients and a pleasant smell, the sticky, shiny residue is not worth the money. You may not have a reaction like my one, but it may be better to stick with your tried-and-tested brand. Hey Becky, Did you know that you need about 1/4tsp of sunscreen for your face to reach the labelled protection? Using half that amount gives you not just half the protection, but more like an SPF of 5 or 6! I think I use more than that anyway! Like I said, I'm a bit obsessive about it! Sounds like a great sunscreen to use, here in Queensland, will defiantly have to check it out next time I go to lush, which is not very often as it's over an 1hrs drive away. Oh no! Our nearest Lush is only about 20 minutes away but I can't drive so it takes a lot longer! Lush have a few different sun products so there might be something better for you. Powder SPF sounds really intriguing! When we go to Florida together (it will happen), I will let you rub my cream in.